This week has been all about the tiny town of Minca, set in the Sierra Nevada mountains in Colombia. 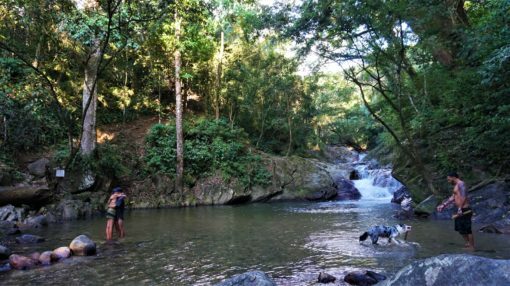 Here the forests are dotted with icy waterfalls and the skies filled with the calls of tropical birds. 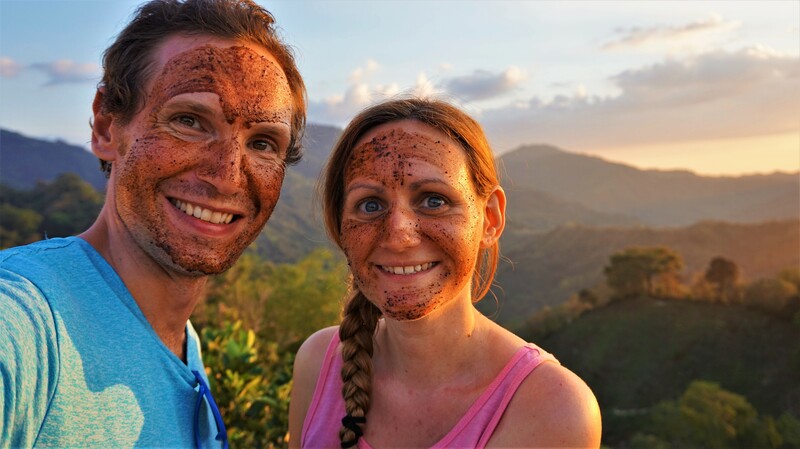 Despite a bout of food poisoning and being covered in itchy bug bites, we’ve hiked, toured cacao farms and hung out in a rustic retreat where a scorpion lived in our open-air bathroom. Some of the places we love best in the world are towns nestled high among mountain ranges, surrounded by forests peppered with cooling waterfalls. 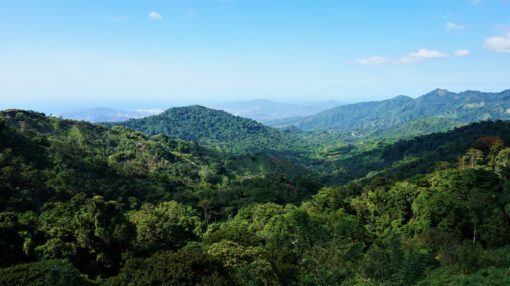 We seek out these places when we travel, from Sagada in the Philippines to Thailand’s Mae Salong and the highs of the Himalayas. 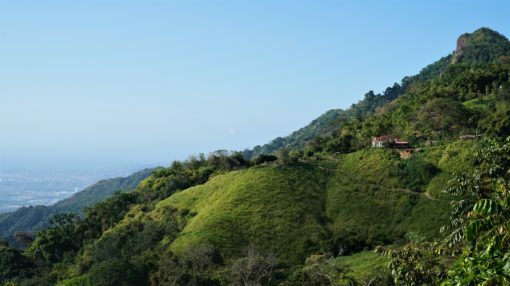 In Colombia, Minca is the perfect place for mountain lovers like us, a welcome change from our week in steamy Cartagena. 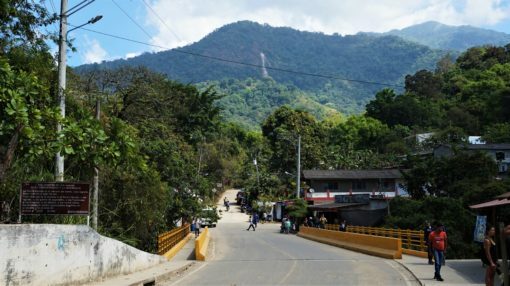 We travelled to Minca by mini-bus from Santa Marta, a sprawling coastal city with a gritty edge. When we arrived, our hostel owner warned us to take taxis instead of walk past 9pm and a fellow traveller told us about a shooting he heard of while he was there. By contrast, Minca is a quiet town consisting of just three main streets bisected by a river and surrounded by green covered peaks. At our hostel, the receptionist handed us a deceptively not-to-scale map of Minca, which we followed over the next couple of days to waterfalls and viewpoints. As we hiked along dusty paths through the dense forest, we spotted humming birds and peacocks, woodpeckers and dozens of other colourful birds we couldn’t name. 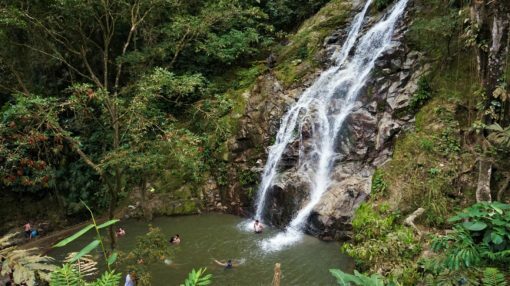 The map led us to Pozo Azul and Cascadas de Marinka, waterfalls and swimming holes with water so icy it made your skin tingle. 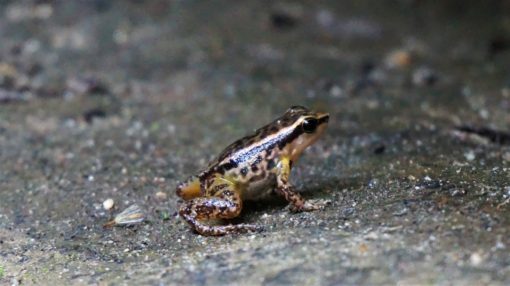 Tiny frogs with ferociously-loud croaks hopped through the shallows while tourists stopped to dunk themselves clean after sweaty hikes, to picnic and to cool down in the waterfall’s breeze. If you Google ‘Minca’, you’ll no doubt come across images of a huge hammock suspended over nothingness against a backdrop of mountain peaks. This famous hammock belongs to Casa Elemento, a hostel set high above Minca. Although the place has changed ownership and its reviews have suffered as a result, we decided to take a two-hour hike up there to see what all the fuss was about. As you can see, the views were worth the climb. After our mammoth trek to Casa Elemento, we returned to Minca to refuel with dinner at The Lazy Cat, one of the town’s top restaurants. That’s when our trip took a turn for the worse and we were struck down by food poisoning. For the next couple of days, we both suffered with vomiting and fevers and could hardly get out of bed. Despite our illness, we hired a car and driver to take us further up into the mountains to an eco-retreat we’d booked, Mundo Nuevo. 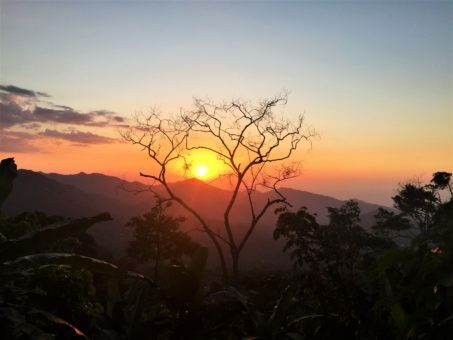 Although we couldn’t stomach the food there, we did take advantage of the peace to recuperate, enjoying incredible buttery sunsets each evening and falling asleep to the sound of insects and bird calls. 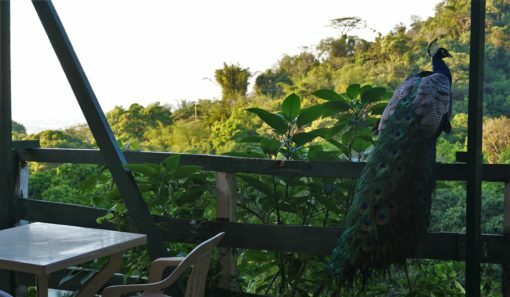 We showered in freezing water in an open-air bathroom that looked out over papaya trees, listened to the wind batter the roof of our hut and while I napped one afternoon, a lizard landed neatly on my forehead. As I went to brush my teeth one night, a noticed a small brown scorpion with a black stinger sitting nonchalantly by the sink. 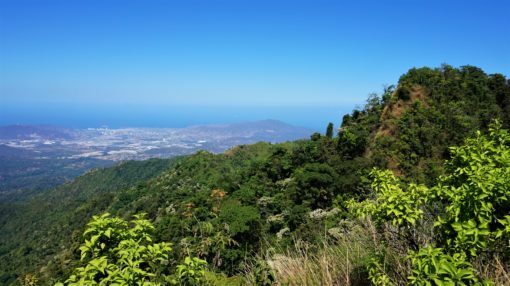 When we finally felt better, we climbed up an incredibly steep path through dense forest to the Mirador 360 viewpoint. 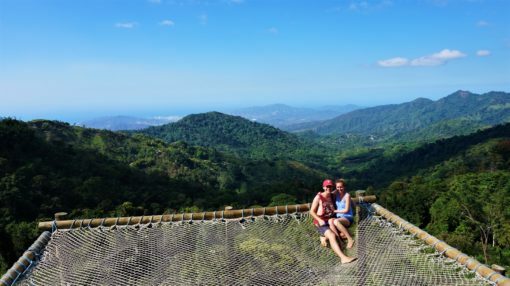 We were rewarded by a private panoramic view of the Sierra Nevada mountain range in one direction and in the other, Santa Marta and the Caribbean Sea. 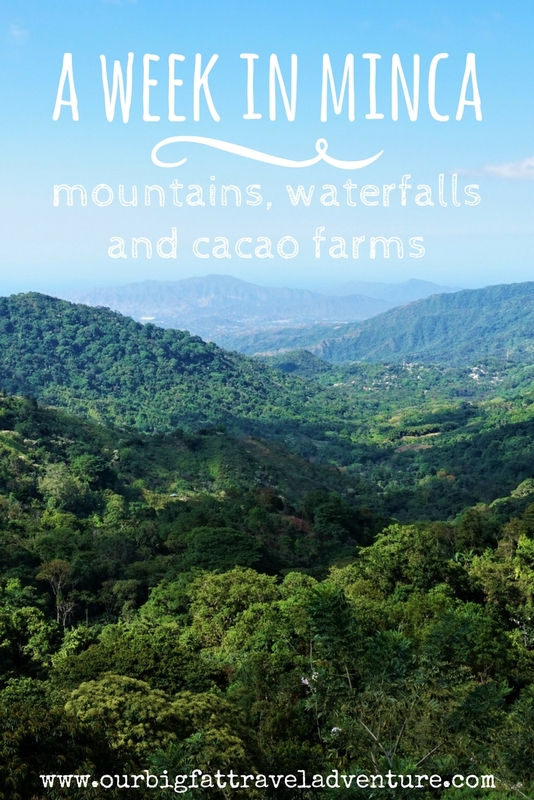 The highlight of our Minca trip was taking a tour at Finca La Candelaria, a family-run coffee and cacao farm. 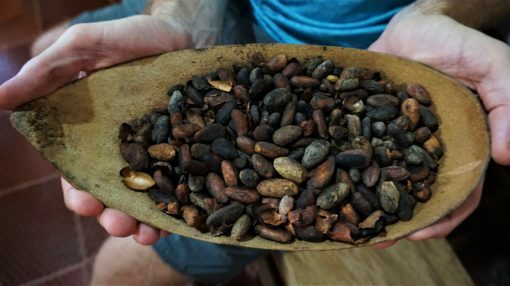 We saw the painstaking production process, from harvesting pods from the trees to roasting cacao nibs and grinding them into a paste to make raw, 100 percent cacao. We got to taste all of this along the way and enjoy a cup of hot chocolate. 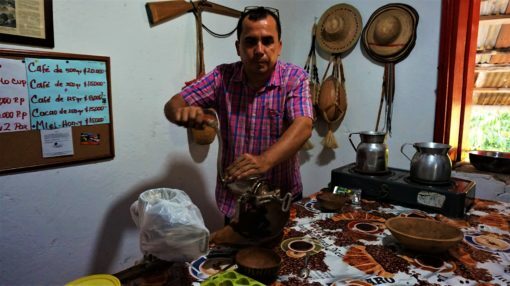 If you’ve never tasted proper cacao, it tastes extremely bitter and nothing like the chocolate we usually consume in the west. 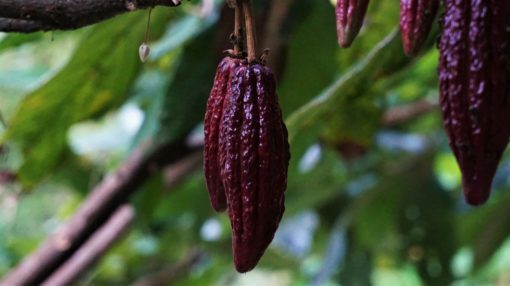 Apparently, the big chocolate companies we’re used to, like Nestle and Cadbury, use only 25 percent of real cacao, the rest is sugar, milk and preservatives. Also, did you know that white chocolate isn’t even made from cacao, it’s just the fat mixed with other ingredients? Our tour ended with a coffee and cacao face mask, which we wore on our hike back to Mundo Nuevo. 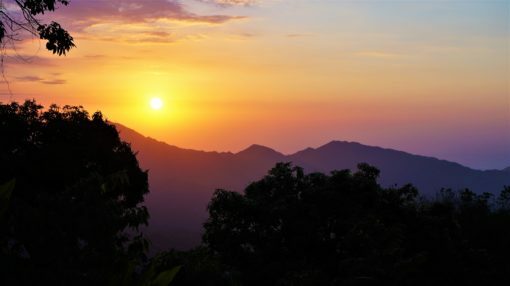 As we walked through the forest alone save for the birds, bugs and lizards, the sun set in shades of orange over the mountains, marking our final night in the magical mountains of Minca. We stayed in Casa Loma. It’s a lovely place. But the view from Mundo Nuevo seems impressive! I have a friend who went there. He staid 5 days instead of 2 hahaha. Hi Thomas, Casa Loma sounds great. Yes, we did try the bakery and loved it, in fact, the bread was the only thing we ate for a couple of days while we were recovering from the food poisoning! Apart from that, we had a great time in Minca. It was beautiful Louisa, minus the food poisoning! Good tip about the charcoal tablets, I’m sure that won’t be the last time we get sick in South America, so we’ll remember that tip.